Russian Defense Minister has announced that his country completed the delivery of surface-to-air missile systems as promised following the downing last month of a Russian spy aircraft manned by 15 servicemen who all died. A Syrian defense force hit the Russian plane while targeting Israeli fighter jets. “The work was finished a day ago,” Sergei Shoigu said. 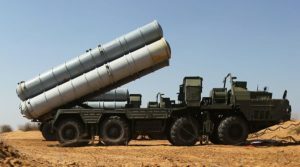 He told a meeting of the Russian security council Monday that Syria has received S-300 systems including a total of four launch platforms. Russia announced late last month that it would supply the Syrian army with the modern air defense system after it accused the Israeli army of deception and lack of professionalism after its Il-20 electronic intelligence plane was brought down by Syrian defense forces. The Russian spy aircraft came in the range of Syrian fire aimed at Israeli F-16 planes, which were carrying airstrikes against Iran’s alleged proxy forces in Latakia province. Israel blamed the Syrian army for the tragedy and provided Russia its own account but Moscow brushed aside the Israeli view. Shoigu also added that it will take three months to train the Syrian military to operate the new air defense systems. Aside from surface-to-air missile system, Russian authorities also added “radioelectronic warfare” equipment, which enables the Russian army to control the airspace in the area used for strikes on Syrian soil. Israel and the U.S. fumed over the delivery, which Tel Aviv believe will end in the hands of irresponsible individuals. Analysts said the new equipment will make Israeli fighter jets vulnerable to the Syrian army. Written by: KanelkaTagba on October 3, 2018. Posted by KanelkaTagba on Oct 3 2018. Filed under Headlines, World News. You can follow any responses to this entry through the RSS 2.0. Both comments and pings are currently closed.